An advert designed to run on the London Underground was rejected because it contained bacon, butter, eggs and jam, an online supermarket said. Farmdrop submitted a photograph which included images of the meat, dairy products and spread. Last month TfL issued a ban on all junk food advertising. Foods found to be high in fat, sugar and salt are now not allowed to feature in advertisements on public transport. 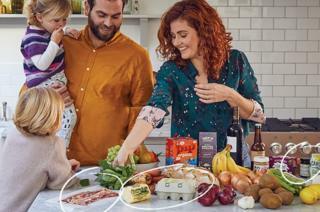 Farmdrop said it cropped out the items entirely for the adverts so that they could run inside Tube trains. It said it wanted to include these items to show that it was more than a "vegetable box" scheme. Farmdrop boss Ben Pugh said: "Our ad was a mixture of balanced wholefoods, while McDonald's Happy Meals and chicken burgers are HFSS-compliant under these rules. It's crazy." He added: "We support the [TfL junk food] ban, but it's being handled very unjustly." TfL said: "Our advertising policy requires brands to demonstrate that any food or drink products featured in advertisements running on our network are not high in fat, sugar and salt, unless they have been granted an exception. "In this case, Farmdrop chose not to apply for an exception and our advertising agent worked with them to amend the advertisement." TfL insisted it had not stated that eggs did not comply with the policy. McDonald's has recently said it never advertised products considered to be high in fat, salt or sugar to children. The ban was introduced as London mayor Sadiq Khan said he wanted to tackle the "ticking time bomb" of child obesity in the city. However, the Advertising Association has said the ban would have "little impact on the wider societal issues that drive obesity".